I’ve been excited to get the Real Food Reality Resources Package into your hands because the contents within answer so many of the questions I get so often about where to start, how to keep up, how to get ahead, and how to save money while on your Real Food Journey. It’s always great to hear your feedback and to know that the information we share really is helpful to you! I’m always encouraged when I read comments like those…so thank you! 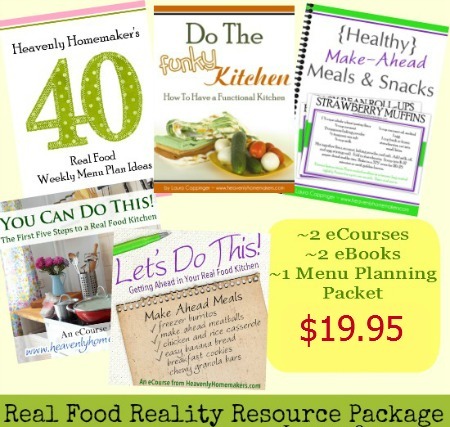 For just a few more days, we’re offering this Real Food Reality Resources Package, worth $24.95, for just $19.95. We want you to succeed on your real food journey. You can do this! Get all of the details about the Real Food Reality Resources Package here. Not only will you receive loads of helpful ideas and instruction, you’ll receive more delicious (and easy!) recipes too! Hello Laura. Thank you so much for making your package so affordable for me. I had a peak at everything and it looks good, good, exceptional!! Your assistants and you did a great job! I have already purchased everything in this offer except for ” do the funky kitchen”. I love your e courses. and your e books. I am becoming a real food mom and wife. my family is enjoying all the new fresh foods I put together for our meals. Thank You! !